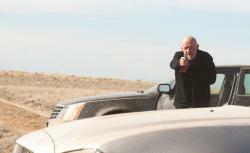 Breaking Bad recap: Mike’s soft spot will cost him. Mike’s soft spot will cost him. Could it be that I’m finally coming to respect Walter White? As I mentioned last week, for the first four seasons of Breaking Bad, my main emotion was ever-escalating aggravation with the show’s central figure. This week’s episode, “Madrigal”, forced me to accept that for now at least, he is tougher and more focused than any of the other criminal geniuses in his orbit. I’m with you, Emily. Walt’s motivation for getting back into the lab is all about self-image. Saul’s observation that a lottery winner does not celebrate his big score by going out and buying another ticket was absolutely on point. Mike, Saul, and Skyler (with her almost catatonic depression) are all correct: The smartest move would be for them to part ways, forget about meth, and just get on with their ordinary, boring lives. But they can’t. Sure, Walt owes Jesse what normal people would consider a serious chunk of change, but I bet Pinkman would be willing to forgive the debt, even without Walt doing too much puppeteering. But then how would Walt live out his superman fantasies? Ordering around the help at the car wash wouldn’t provide the ego boost he needs as much as meth needs precursor chemicals. At the strategy session in Saul’s office—which reminded me of a Flight of the Conchords band meeting—Walt demanded that they cook inside the city limits because he didn’t want an irksome commute. When the others objected on the common-sense grounds that more people means more prying eyes, Walt countered by declaring, “If Gus can manage it, then so can we.” “HUBRIS,” I wrote in my notes. But by the end of the episode, I was convinced that he was right. He will manage it. Learning that the DEA had tracked down the offshore accounts where Gus had stashed Kaylee’s $2 million was obviously a major blow to Mike’s unflappable froideur, but maybe he still would’ve settled for eking out a quiet existence drinking beers and watching classic movies at home. In the end, though, it was Lydia’s love for her daughter that doomed him. By my reading, he was going to take Lydia out of the house, kill her off in the desert somewhere, and then head back to his recliner. That felt like the percentage move: Her campaign to prophylactically kill him and his men would be over; there’d be no more demands for ridiculously memorable meetings in the diner; and he could get back to his game of Hungry Hungry Hippos. But when she pleaded with him not to let her daughter think she’d been abandoned, he relented. Did he back down because Lydia wasn’t just selfishly asking to live, but instead making demands for the sake of her daughter’s sanity? Did he see his own granddaughter in her little girl? Or did it just seem like everything was screwed up anyway, so he might as well start building up another stash for Kaylee before the Walter White time bomb goes boom? Having grown up in England, I’m a sap for scatological humor, so naturally I enjoyed all this week’s bathroom imagery. The lavatory was Walt’s go-to method of washing away evidence. (Quick question: Did he flush the vial of ricin down the loo? If so, isn’t that, um, dangerous?) And naturally after all that flushing I giggled when Mike told Lydia that his guys are “solid” and Hank later advised him to “do yourself a solid.” But Herr Schuler’s tumble off the toilet seat, accompanied by an automatic flush, was the pièce de résistance.